Although the markets have their own logic, highly capitalized gold-mining companies seemingly should belong on any “stocks to buy” list. Thanks to rising geopolitical tensions and soaring trading sentiment, many folks seek safe-haven assets. While gold stocks seemingly offer a viable solution, their overall performance has been unusually disappointing — with the price of gold down 6.2% as of Oct. 24. I believe that this irrational circumstance will eventually find a logical basis. When it does, today’s beaten-up and undervalued gold stocks could witness a robust revival. Since the beginning of this decade, gold prices have only increased 10%. That’s a shockingly bad figure, even for precious metals. The Dow Jones index, however, has jumped more than 130%. While I don’t begrudge the equities sector enjoying its resilient bull market, the underperformance in gold stocks doesn’t quite jibe. Primarily, the U.S. dollar index has cratered ever since President Donald Trump took office. Since the start of his administration, the dollar index has dropped roughly 5% in value. The losses would have been much worse were it not for a recent walk up. A weakening dollar typically corresponds with higher commodity prices; hence, Brent crude oil gained roughly 40% since Trump’s first day as president. This makes sense: more dollars (inflation) are chasing fewer goods. In contrast, gold is up only 2% since Trump took over the helm, and for the year, bullion prices lost roughly 6.5%. I’m not here to cry about a few percentage points. Rather, I don’t think this unusual circumstance can last. With the active conflict in Syria, an ongoing trade war with China, our relationship with Saudi Arabia on shaky ground and an unpredictable North Korea, we have massive foreign-policy crises. Add to that Donald Trump? Here’s my top 20 list of gold stocks to buy. While gold stocks usually have a volatile reputation, Franco Nevada Corp (NYSE:FNV) is about as stable as you’ll find in this sector. As a gold royalty and streaming company, Franco Nevada isn’t levered to any one specific project. Therefore, FNV doesn’t have the sharp unpredictability of junior miners. The overall market has been, however, decidedly illogical. We have both economic and especially geopolitical concerns, yet many gold stocks continue to flounder. That’s what we’re seeing with FNV. Despite a strong outing in its recent first-quarter 2018 earnings report – which produced nearly a 21% positive surprise – shares are down 19% year-to-date. I can’t imagine that FNV stock will continue staying this undervalued, considering its fiscal stability and performance. If you want as close to a surefire way to buy gold without getting burned, consider Newmont Mining Corp (NYSE:NEM). Founded in 1921, Newmont Mining is currently the only gold producer listed in the benchmark S&P 500 index. Since fiscal 2015, Newmont has enjoyed revenue growth averaging nearly 10%. Furthermore, NEM appeals to conservative-minded investors with its fiscal discipline. In the last four years, management has kept a tight lid on operating expenses. Moreover, its steadily reducing capital expenditures over the same time frame. On a YTD basis, NEM stock is down 15%. It’s not the sexiest play among gold stocks to buy, but it likely won’t leave you stranded for long, either. Even in an ancient industry like precious-metal mining, you can still teach an old dog new tricks. Barrick Gold Corp (USA) (NYSE:ABX) proves that with their seamless marriage of an old-school occupation with new-school applications. Recently, Barrick Gold Corp introduced their Analytics & Unified Operations (AuOps) Center. With AuOps, ABX installs data-recording sensors throughout their projects. In addition, equipment, machinery, and even workers are hooked up to these sensors, enabling management unprecedented analytics. One of the key advantages is that ABX can improve efficiencies without taking shots in the dark. This year, ABX stock hasn’t responded well in the markets. This despite the company producing solid results for its recent earnings report. As with other gold stocks to buy, I don’t anticipate that this undervaluation will continue indefinitely. Senior Canadian miner Agnico Eagle Mines Ltd (USA) (NYSE:AEM) is an ideal opportunity for those who want exposure to gold stocks but without undue market risk. All Agnico mines are located in Canada, Finland and Mexico, with developmental activities in the U.S. and Sweden. Thus, you’re unlikely to experience repatriation risk with AEM. Agnico also has some fairly solid fundamentals. Its operating and net margins are above average against other gold stocks. The company has also enjoyed revenue growth since at least the past four years. Just as importantly, management maintains fiscal discipline, controlling cost of goods sold and operating expenses. For the year, AEM stock is down 20%. However, since the end of September, shares have gained 8%. I expect further market profitability as the underlying gold market improves. Goldcorp Inc.’s (USA) (NYSE:GG) website emphasizes that they utilize a “lean, highly skilled” leadership team. While I usually take corporate-speak with a grain of salt, GG has quantifiably lived up to its word. After a rough phase in the precious metals sector that wiped out several players, GG cut out the fat. Compared with their fiscal 2014 report, management sharply reduced their operating expenses. Thanks to their disciplined efforts, the company returned to profitability in 2016 and 2017. Additionally, they have reduced their annual capex from a few years back. So far, the markets have a generally favorable view towards Goldcorp’s strategies. On a YTD basis, GG stock is down 19.3%. It’s far from stellar, but GG stock should experience upside if the gold market improves. Another royalty and streaming company, Royal Gold, Inc (USA) (NASDAQ:RGLD) avoids the risk of putting your eggs in one basket. Moreover, Royal Gold’s target projects are in stable countries. The vast majority are in Canada and Mexico, followed by the Dominican Republic, Chile and the U.S.
A compelling reason to consider RGLD stock is that the company has thrived since the last gold bear market. Since fiscal 2014, revenue growth averages 23%. In addition, RGLD has kept expenses from blowing up. As a result, Royal Gold had a standout year in 2017, generating $101.5 million in net income. While RGLD stock is down 6.3% YTD, it fares much better than the competition. I expect some near-term successes, too, especially if the underlying gold market cooperates. With a market capitalization north of $4 billion, Kinross Gold Corporation (USA) (NYSE:KGC) is one of the biggest gold stocks available. Its main claim to fame is asset diversity. Kinross Gold’s project portfolio encompasses locations in the U.S., Brazil, Chile, Ghana, Mauritania and Russia. Conservative investors who typically shy away from this sector are attracted to KGC for its relative financial stability. Since the gold market collapsed back in 2013, Kinross has focused on chipping away at its long-term debt. In addition, management cut any excess fat that was holding back the organization. The result? KGC returned to profitability last year. Right now, the markets aren’t respecting the corporate efforts. KGC stock is down 37% YTD. Overall, I view the bearishness as an exaggeration, especially considering its massive Q1 2018 earnings beat. Companies are defined not by how successful they are in bull markets but how they respond under pressure. On the one hand, when the precious metals and commodities sector fell apart in 2013, many organizations simply folded. Iamgold Corp. (NYSE:IAG), on the other hand, rolled up its sleeves. An analysis of their longer-term financials reveals the company’s focus and determination. Any excess or unnecessary expenses were slashed. Capex fell sharply from four years prior, and in doing so, free cash flow turned positive. Overall, management’s efforts returned IAG to profitability in 2016, and they enjoyed a standout year in 2017. The response in the markets was muted for much of the year. While IAG stock exploded upward nearly 21% from mid-March through May, the downturn in gold in mid-August took IAG stock down to a loss of 38% for the year. IAG looks promising, especially considering how geopolitical events are stacked up. Formerly known as Silver Wheaton, Wheaton Precious Metals Corp (NYSE:WPM) is one of the most popular stocks to buy. Utilizing a streaming business model, WPM offers relative cost predictability. In addition, the company provides direct-leverage as precious-metal prices increase. As with other sector players, the gold bear market hasn’t been kind to WPM. That said, Wheaton’s streaming business model mitigated much of the damage. For instance, their expenditures are stable from year to year. In addition, management focused on controlling its capex, while steadily chipping away at its debt exposure. On a YTD basis, WPM stock is down 22.5%. However, since the beginning of March, shares have jumped over 14%. With cleaner financials, and a better market environment, I see much potential with Wheaton Precious Metals. Risk-averse investors often pick large capitalization gold stocks to avoid the volatility associated with junior miners. But every once in a while, you’ll come across big names that are experiencing uncharacteristic choppiness. That’s the case for Newcrest Mining LT/ADR (OTCMKTS:NCMGY). With a market cap just under $12 billion, Newcrest Mining is easily among the top industry stalwarts. However, investors haven’t been impressed with Newcrest’s pedestrian revenue growth. In addition, net income has declined in the past three years. On a YTD basis, NCMGY stock has dropped nearly 20% of market value. However, the bears could be overlooking some important factors. For instance, management has significantly reduced operating expenses compared to four years prior. Debt levels, while high, have also declined. It’s a risk, but one I believe is worth taking with speculative money given the company’s overall reputation. Another big name among gold stocks, Eldorado Gold Corp (NYSE:EGO) has a market cap over $757 million. Eldorado also has an enterprise value a few million shy of $1 billion. But despite its relatively sizable presence, EGO could use a break. On a YTD basis, EGO stock has dropped nearly 33%. Much of that has to do with disappointing fiscal performances. Revenue growth cratered over the last four years. Not only that, its operating expenses uncomfortably increased last year. Furthermore, its debt levels and capex remain elevated. So why am I discussing Eldorado Gold Corp? Its speculation, but EGO stock has stabilized since early last month. Should the underlying gold market improve, and I believe it will, EGO could rise along with everyone else. Headquartered in Lima, Peru, Compania de Minas Buenaventura SAA (ADR) (NYSE:BVN) is one of the underappreciated plays among top gold stocks to buy. BVN has a market cap just a little shy of $4 billion. It also features a $4.56 billion enterprise value. Since fiscal 2015, BVN averages 17% top-line sales growth. Moreover, management has maintained strong fiscal discipline, with operating expenses down over the past few years. As a result, operating margins improved to 11% from 3% in fiscal 2014. Most importantly, Compania de Minas Buenaventura returned to profitability last year. BVN stock is one of those cases where the markets’ price discovery makes logical sense. Shares are only down a percent, although I feel upside is coming. Generally speaking, BVN is riding a bullish trend channel since July of last year. With a market cap of just under $3 billion, and an enterprise value of $4.56 billion, Gold Fields Limited (ADR) (NYSE:GFI) is not what you would call a small player in precious-metal mining. However, GFI has taken a huge dump so far this year. Against the January opener, GFI stock dropped more than 16%. That’s really bad, even compared against other volatile gold stocks. Not to pour salt on festering wounds, but GFI peaked in September of last year. Since then, Gold Fields has been mired inside a frustrating bearish trend channel. The financials aren’t helping matters much, either. Revenue growth is pedestrian, and Gold Fields’ earnings fell into red ink last year, while its competitors have become profitable. Furthermore, its capex has increased uncomfortably for potential investors. Ordinarily, GFI isn’t something I’d like to touch. But with potentially rising sentiment in the precious metals and commodities sector, GFI offers an intriguing, albeit speculative opportunity. Headquartered in New South Wales, Australia, Evolution Mining Ltd (OTCMKTS:CAHPF) may not be a household name here. But that could quickly change if the gold sector turns around decisively. Evolution Mining has a market cap just over $4 billion, and a $4.2 billion enterprise value. Revenue growth has been very strong over the past three years, averaging 52.5%. Most of that haul occurred in fiscal 2016. However, Evolution Mining returned to profitability last year in part thanks to higher nominal sales and disciplined fiscal controls. CAHPF stock is one of the bright stars among high-market cap gold stocks. For this year, shares have gained over 10%, and against the trailing year, CAHPF is up an amazing 30%. Put Evolution Mining on your watch list, especially if the underlying sector improves. Sometimes, the markets punish good companies excessively for not hitting certain benchmarks. Randgold Resources Ltd. (ADR) (NASDAQ:GOLD) is a recent example of this unfortunate dynamic. Despite being a top contender among gold stocks, Randgold fell short in its Q1 2018 earnings report. I get that investors typically want to sell a poor earnings performances, but this usually occurs for high-flyers. In Randgold’s case, GOLD stock is down nearly 18% YTD. That’s not a great time to give up, especially with geopolitical concerns heightening. More so, investors should consider the overall picture. Randgold is one of few gold miners who is consistently delivering profitable earnings. Management is also very disciplined, reducing operating expenses and keeping capex in line. It also has consistently positive free cash flow. I’d keep a close eye on GOLD stock as I believe it’s significantly undervalued right now. Another big player in the precious-metals market, Alamos Gold Inc (NYSE:AGI) has a market cap just shy of $2 billion. Yet despite its relatively lofty status, AGI like so many others has faltered this year. I’m not seeing eye-to-eye with Wall Street here. Since fiscal 2014, Alamos has averaged nearly 24% top-line sales growth. Management has also maintained fiscal discipline and strong cost controls. Thanks to the leadership team’s efforts, AGI reversed its horrific losses from years past. Last year, it decisively returned to profitability. Yet so far this year, AGI stock is down 29%. Perhaps investors weren’t too thrilled about Alamos merely meeting expectations in Q1 2018. Whatever the reason, AGI seems awfully undervalued considering its solid efforts. Looked at from a nearer-term perspective, B2Gold Corp. (AMEX:BTG) doesn’t seem appealing, especially to conservative investors. On a YTD basis, BTG stock is down nearly 15%, making it one of the worst sector performers. However, broaden the scope and BTG appears much more compelling. Shares hit close to rock bottom in mid-January of 2016. At the time, BTG was trading hands at 72 cents. Against that level, shares have veritably skyrocketed 276%. Generally speaking, B2Gold has been charting a series of higher lows over the past two-and-a-half years. I expect BTG to continue its positive performance. Management runs a fairly tight ship in terms of cost control. The company is also focused on reducing its long-term debt exposure. Compared to top market cap gold miners, New Gold Inc. (AMEX:NGD) is one of the riskiest plays. The company has a $1.34 billion market cap, along with a $2.15 billion enterprise value. However, NGD stock is clearly a disappointment, and it’s not hard to see why. Although fiscal 2017 annual revenue increased significantly against the prior year, NGD slipped sharply against 2014 and 2015 results. Not only that, its earnings are awash in red ink despite management efforts to reduce operating expenses. Long-term debt has ballooned over the years to $1 billion, and free cash flow is a mess. So why take a shot at NGD stock? Again, it’s very speculative, but shares hit rock bottom back during the 2008 financial crisis. Since then, on a broader view, NGD has charted a series of higher lows. Perhaps, if bullion enters a strong bull market, NGD would likely moon. Presently, Yamana Gold Inc. (NYSE:AUY) is a bit of a basket-case. Yamana has a strong brand presence in the mining sector, with a market cap exceeding $2.6 billion. That said, AUY stock absorbed some tough blows in 2018. I can’t say I blame investors for not seeing the light. Yamana’s COGS are out of control, putting the company in a bad position before it gets to the middle of the income statement. The bottom line has improved significantly in recent years, but its still mired in red ink. Capex also ballooned last year, and free cash flow is negative over the past five quarters. In other words, AUY stock is a technical speculation. However, I think you can make a strong case here. AUY charted rising lows since December of last year. Generally speaking, shares have steadily risen since January 2016. If decisively positive sentiment returns to the precious-metals market, AUY could accrue benefits from mere association. Harmony Gold Mining Co. (ADR) (NYSE:HMY) was off to a great start this year. At one point, HMY stock gained over 32%. Unfortunately, investor sentiment dramatically collapsed, sending Harmony Gold careening to the ground floor. The company’s financials reveals a mixed bag. Revenue growth was strong in 2017, gaining 12% against the prior year. However, at $1.42 billion, sales were down 6.5% from four years prior. Not only that, COGS increased significantly in 2017, resulting in lackluster earnings. Finally, capex remains elevated, applying pressure on free cash flow. That said, a 15% loss against this year’s closing high seems a bit overdone. Additionally, HMY stock hit bottom in November 2015. While the price action has been extremely choppy, the general sentiment is positive. If the underlying gold market can break free from its funk, HMY stock might surprise Wall Street. 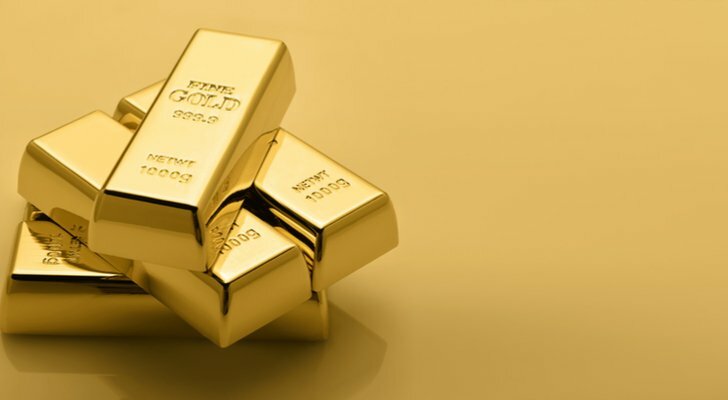 Article printed from InvestorPlace Media, https://investorplace.com/2018/10/top-20-gold-stocks-buy-despite-irrational-markets/.